The words of our clients are powerful! We love asking our clients for their thoughts regarding QuickTrainer---our classes, our bookkeeping services, our training, etc. We must admit, we sometimes read these, blush and think to ourselves, "wow, our clients really do love us". Just know, the testimonials below are our clients' own words. We don't coach or script these words. Scroll down to see what they say about the service you are in need of. To our clients, Thank You! Love Jim! He helped me years ago when I was working for a company who was transitioning from Peachtree software to QuickBooks (thank God!). He taught me much, and now that I work as a realtor full time and we have our own business, I will always remember your company should I need help in the future! Highly recommend! Excellent! Jim knows every aspect of QuickBooks and has been a huge asset to us! Jim Merritt of Quick Trainer has been an amazing resource for our Quick Books training needs. He is great at sharpening your QB skills. Jim and Quick Trainer are very responsive and make the learning easy. QuickTrainer has been easy to work with, thorough, understanding, timely, and willing to educate me as a small business owner about how to best maintain my company books. I highly recommend them! Jim worked wonders with my QB payroll accountlast year. I had not moved my QB desktop payroll to my new QBO account for the first 7 months of 2015! I kept saying I would. I contacted Quicktrainer and he got me all set up CORRECTLY so that I could file my quarterlies! Thank you Jim for getting my QB all cleaned up well before tax season! Jim and Denise have been wonderful help. I was having an issue with my Quick Book not allowing me to sign in and complete payroll. Jim was able to get that issue resolved and me back into my Quick Books. Thanks so much you two! QuickTrainer does a good job of managing people's books as well as training them on Quickbooks itself. I recomend them as a great group of people to talk about for all things Quickbooks! We are so grateful for Jim's timely availability and expertise in QuickBooks [Enterprise Solutions] Desktop and bookkeeping/accounting. Denise and Jim are AWESOME! I would recommend them to anyone working with QuickBooks Enterprise! Great knowledge and insight. -Randy Siegel, Signature Plumbing, Inc.
We were very pleased with the service we received in installing QuickBooks Enterprise on our computer. Jim is very knowledgeable and very professional. Everything worked great with no problems afterwards. We would highly recommend him. They are always friendly and helpful. In QuickBooks, as in other software, when you make a mistake it always affects so many other things. When you try to fix them it can make them a lot worse if it is not done correctly. It is a good feeling to know that have someone who is competent like Jim Merritt who can help out. Jim encouraged me to see that I was not doing things as poorly as I thought I was! I am not a QuickBooks Pro so I greatly appreciated his expertise in showing me some great tips on how to change some things in the future. It was a great investment to have him look at things with Pro-eyes and gave me more confidence in what I have been doing! You always take care of our QuickBooks/Point of Sale issues! Great service! Smart people that keep us on track. Jim and Denise are awesome! They make Intuit problems and or issues so much easier to deal with. I would definitely recommend for clean up and maintenance or whatever else you may need!! If you are not on a maintenance plan with QuickTrainer then it may be something you want to think about. I am happy to know they will keep my records in order all year long!! Jim & Denise have provided excellent QuickBooks service for over 5 years. They are also always so patient and pleasant. Jim did a great job. We discussed what I wanted to see happen and then some other items that might help me in my daily tasks. He completed the items that I wanted done and then gave me some explanations of what we can do in the future to help improve my use of the QuickBooks. Have been trying to set up QuickBooks for months. The more I tried, the worse it got. Jim came to our business and fixed, simplified and taught me some great information. I now have the confidence to use QuickBooks. QuickTrainer is great! After just one session, I have a much better understanding of how QuickBooks works. Jim is extremely patient and knowledgeable and a pleasure to work with. I am looking forward to more training. Jim really knows his stuff. Unfortunately during our first session, we had to spend ALL of that time correcting things that the QuickBooks support people had told me to do. Jim really helped to get the information correct. Jim is very knowledgeable, very personal, and was a great help. Working with Jim and Denise Merritt is both a pleasure and cost saving. I am self-trained in QuickBooks and needless to say, I have many gray areas. Not only do they help with errors, they educate me so I understand how I made the error. They are professional and accurate with the complicated and the simple; always with resolution to my needs. You were excellent and just what I needed. I haven't yet had a chance to put what you taught me to use, but even if I flawlessly execute everything you showed me, there's still a fair chance I'll be reaching out to you again later for the next problem(s) to pop up. If you ever need to provide a reference to a prospective client, feel free to have them contact me. I would like to thank you for your kindness in answering questions concerning QuickBooks. We are so grateful for you kindness and generosity to us. So far, using sub-classes has been a success. Thank you for your recommendation that has saved us money and, I’m sure, a few headaches. I have and will continue to send people your way who are in need of skills! I thought I'd be able to purchase QuickBooks and then buy a book to help me learn to use it, but there was so much I was missing. I was quickly frustrated and before I knew it almost a year had gone by since I had touched QuickBooks and I had a pile of receipts and banks statements to reconcile. I anxiously reached out to Jim and Denise at QuickTrainer for help and was quickly calmed with reassurance that they would get me on track. Jim was very patient with me, my inexperience and lack of accounting knowledge. He was flexible with my time restraints and broke up our one-on-one training session into manageable mini-sessions with "home work" to make sure I absorbed the information we reviewed. I was up late one night working on reconciling my sales taxes worrying that my numbers were not adding up correctly and so I e-mailed Jim to ask for his guidance (not expecting an immediate response because of the hour). Sure enough he responded to my late night e-mail with reassuring words and a time we could talk the next day. It was a relief to know I had someone reliable, responsive, patient, and willing to teach me how to use and customize QuickBooks for my industry and on a MAC! I'm much more confident than I was a year ago using QuickBooks to manage my finances. I appreciate all of the support I received from Jim and Denise at QuickTrainer and I strongly feel that the value I received far outweighed the monetary cost. I have been working with Jim & Denise on and off for over a year now and have never experienced such an excellent level of service with any other QuickBooks trainer. I have been a bookkeeper for 20 years and now and then run into a question, especially with Point Of Sale. In the past I would wander through the various QB sites, wasting lots of time (and often $). Then I found Jim. As a reference for my clients, I purchased his book. The screen shots are very helpful. Jim is prompt, answers clearly and accurately and always with a smile. I can't say enough +++ about QuickTrainer. I doubt there could be anyone more knowledgeable or willing to help. Jim renewed my confidence that QuickBooks would work for our business. Thank you for always being available when a problem presents itself.I am still learning how to use QuickBooks efficiently and effectively. Jim and Denise, you guys never make me feel like my problem is too small or that I, or my company, is not important enough.My husband and I would recommend them to anyone.We find them to be HONEST, FAIR, and they don't nickle & dime you.WE STRONGLY RECOMMEND JIM AND DENISE MERRITT TO EVERYONE LOOKING TO LEARN & IMPROVE THEIR QB SKILLS. Thanks so much! We are quite grateful and impressed with the services and help you have provided us. It is changing the way we do business! Just wanted to say thanks for another year of help. You guys provide me a very valuable service. I know I am a peon customer but your help is much appreciated! I want to thank you so much for taking the time to resolve my printer issue. I did as you instructed and that seemed to resolve my issue. Now I know why we do business with QuickTrainer, because you guys are so awesome! I was recruited by an absentee owner to assist in getting a handle on the business after they were left in a lurch by two bookkeepers. I was familiar with Quickbooks financials but not QuickBooks POS. I made several calls to QuickTrainer who graciously answered my questions free of charge. In short order, I realized the best decision I could make for this owner was to hire QuickTrainer to successfully have Quickbooks POS and QuickBooks Financials in sync. QuickTrainer had a thorough knowledge of both systems and zeroed in on what needed to be accomplished. The efforts of QuickTrainer to get the company on track have been invaluable. We appreciate their help and would extend our assurance of their skills, experience and professional service. Jim was excellent at making the process of learning QuickBooks simple. My needs were met and I feel confident I will be able to produce the information I need to have a successful business. QuickTrainer has provided me with expert training in QuickBooks. There are no software books that can fully teach you the intricacies of QuickBooks as well as the staff at QuickTrainer. I have never left a training session with unanswered questions - the staff is thorough and always willing to help me with any QuickBooks issues I may have. I enjoyed how QuickTrainer applies QuickBooks training to a "real world" scenario. And beyond the training course, QuickTrainer has been readily available via phone and email to answer any and all of my questions. I have created a long-term business relationship with QuickTrainer so that my business uses their consulting services on a regular basis to make sure my company's QB file is on track and heading down the right path. As our business grows, QuickTrainer has been there to help me with QuickBooks, and I know they will always be just a phone call away! 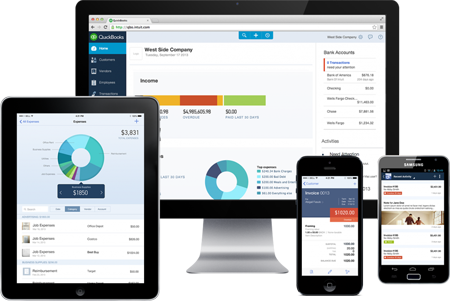 QuickTrainer has been an asset to our business by helping organize our QuickBooks and has been valuable in training me to use QuickBooks more effectively. Through consistent training practices, accessibility and QuickTrainer's interest in my progress, my understanding of business accounting has been positively impacted and made me much more efficient at my job. I would highly recommend QuickTrainer to any business. QuickTrainer has been a wonderful resource for me in my small business. After months of trial and error trying to properly configure my QuickBooks Online program, and asking accountant after accountant, I finally found someone who could help me with my specific problem. After two short hours at my place of business, working one-on-one, QuickTrainer was able to quickly identify the problems, and subsequently implement the solutions; all the while showing me how to use the program as well. Since their help, I've been able to reconcile all my accounts without any problems at all! Thanks QuickTrainer! After consulting with several accounting professionals who were unable to answer my QuickBooks questions, I contacted Jim Merritt. Jim worked side-by-side with me to help me fine-tune a billing system that would work for my very specialized business. QuickTrainer has been a true lifesaver for me. They came in and cleaned up my books and set me up to be more efficient on my own. In the past, we haven't taken a lot of time to keep our books up-to-date and QuickTrainer was wonderful in getting me back on track! How to handle child support and employee advances are just a few of the things I learnedin this QuickBooks Payroll class. The set-up of payroll is very important and QuickTrainer taught me how. This (payroll) class provided me with a clear understanding of how to properly setup employees and file and pay payroll liabilities! It's not nearly as scary as I thought it was. I also learned I was paying my accountant four times the cost of this class for something I can do myself in just a few minutes a quarter. Jim was very knowledgeable and he didn't make me feel like a moron for not knowing much about "tax stuff". He was extremely helpful with all of my QuickBooks payroll questions. The three most important things I learned today were: basic payroll information; what forms to file and how to file them; and how to write paychecks. Your QuickBooks Payroll class was one-on-one. I asked every question I had. I learned about the payroll liability forms; default settings are not always good; and don't write check from the QuickBooks check register. I learnedin this QuickBooks Payroll class how to start managing payroll; how to go back to fix a mistake; how to view a report. It was great! It exceeded my expectations and was very easy to understand. Sign up! QuickTrainer is ALWAYS willing to go above and beyond! Denise is at our office every week doing our payroll for us. She is always thorough and efficient. Denise and Jim KNOW QuickBooks! Let them help you too. Denise helped us out, to recover from an incompetent CPA. Great at keeping me on track with ALL of our Financial Information. I highly recommend Jim and Denise for all your bookkeeping needs. "I literally COULD NOT RUN MY BUSINESS without QuickTrainer. They let me take on more than I probably should, because I don't have to worry about the books. Love you guys!" Trusting someone with your financials can be extremely nerve racking! So more than anything I trust Denise. She has done an amazing job handling our QuickBooks. She saved us almost $600 on our 2011 tax return preparation. She is extremely valuable within our business. After 4 years of frustration I switched to QuickTrainer for all my bookkeeping. WOW! AMAZING! For the first time every my P&L and Balance Sheet are accurate! It took my accountant just a couple of hours to file my business taxes. Using QuickTrainer has saved me time, aggravation and money. Thanks Jim and Denise Merritt. The cost was worth it. You are the best investment I make for my business. As the owner of a childcare facility, I feel so grateful to have found Denise and Jim Merritt of QuickTrainer. Their services have enabled me to focus on my job and leave the bookkeeping in their capable hands. I cannot begin to express the peace of mind that I have been granted because of their expertise and trustworthiness!! We were very fortunate to find QuickTrainer. After explaining my needs, Jim and Denise came out to my store and explained how they could help me on a weekly basis with my daily sales entries, payroll, A/P, generating checks to vendors, and printing monthly reports, such as profit and loss, and cash flow. QuickTrainer has truly been a lifesaver. They are prompt, efficient and very knowledgeable of every aspect of QuickBooks. My time is now devoted to marketing and generating more sales. I highly recommend the bookkeeping services provided by QuickTrainer, and would be glad to be called on as a reference for anyone interested. Jim & Denise Merritt couldn't be more helpful, prompt or willing to assist you in any problems you are having with QuickBooks. -Patricia Schaller, Boone Paving & Asphalt, Inc.
QuickTrainer has been our lifesaver! I am pretty good with software, but not having any financial background, QuickBooks really gave me a run for my money. I gave Jim and Denise a quick call and within a few hours of meeting with Jim, I was so much more confident in my QuickBooks skills and it has already produced huge benefits for our growing company. More than anything, I appreciated Jim's commitment to continue helping me beyond our class. That was really pleasing to hear. Thanks guys! This was a very informative QuickBooks class. Well taught and helpful. I would highly recommend QuickTrainer. I received a great introduction to QuickBooks from Jim. I especially liked that I created a QuickBooks company file from inception to bill paying to all the rest. This QuickBooks class was worth every penny. I learned a lot of new and useful information. Jim knows what he's talking about! The three most important things I learned today: shortcuts with reconciliations, job costing, always memo. The QuickBooks class was very helpful and motivating. Very helpful, useful! Jim was very tolerant of my 1,000 questions and was very informative! (Three most important things I learned today were) details on job costing; importance of entering proper items; cash vs. accrual. I learned how to use QuickBooks more efficiently. Invoicing; balance sheet; entering bills are the three most important things I learned today. It was a good use of my time as it helped me familiarize myself to QuickBooks. This QuickBooks training has given me the confidence I need to fulfill my employer's needs. It was easier for me to understand! The class size was perfect. Questions were answered until understood. I learned how to edit preferences; billing progress invoicing; and memorized billing. I learned to always 'memo' transactions; how important it is to subscribe to online backup; and, overall, just a better understanding of QuickBooks. The three most important things I learned in this class were job tracking, progressive invoicing and how to reconcile statements. This will help me save time from this day forward. Great way to learn the "extras". Learned about items that didn't know existed before. Thank you for the experience and info. Jim is very knowledgeable and spent ample time addressing all of my questions. I highly recommend this class for those that are new to QuickBooks and those with experience. I enjoyed the class; it was a good experience to learn something new. I think other people who are interest in accounting can learn from this class. The QuickBooks class was very informative and helpful. The class size was great and allowed for specific questions and assistance. I would recommend this class to any small business who manages their own books. I learned so much to bring back to my company to help save time and operate more efficiently! Sales receipts will eliminate spreadsheets. The instructor taught QuickBooks in a manner that was very easy to understand. Two of the most important things I learned today were how to properly handle petty cash and how to properly enter credit card transactions. I learned to memorize bills, to reconcile my bank and credit card accounts, how to use customizable invoices and about the 'find' feature. Thank you, Jim! I was very apprehensive coming into the class since I am a 'techno dummy', but Jim (the instructor) was very reassuring in telling me I can do it. He used simple language and broke everything down into small bits of information. When we put it all back together, it actually made sense. Very informative; personal attention to my needs; took away some of the fear; used language I could understand; reviewed material; let me do it instead of watch; use the memo area for all things; feeling more confident. Your QuickBooks class instructor was very patient. The class is excellent. Your class is the easiest way to learn to navigate QuickBooks. This class was a good use of my time because it allowed me to familiarize myself with QuickBooks. I am a new business owner with a passion for what I do. However, QuickBooks financials is not one of them. Also, because of the many "hats" I wear, finding the time to learn QuickBooks on my own was impossible. QuickTrainer's QuickBooks Class has been a GREAT start and I look forward to getting consulting help from Jim and Denise. This [QuickBooks class] educated me about the basics of QuickBooks. I hope I can go back to my employer and implement changes that will make the company run more efficiently. Jim was easy to follow [during his QuickBooks Class]. He created situations pertaining to my company and this was very helpful. The QuickTrainer QuickBooks Class was the best investment into our business we've made all year! I am walking away from this training session confident, excited and ready to use QuickBooks. This will take our business to a whole new level! I took your class this past summer and I wanted to send a quick thank you. I took the class before I even opened the QuickBooks program so I had no idea what I needed to know or how to do anything. Your class did a great job of preparing me on what I needed to know to get through QuickBooks. I would recommend your class to anyone who needs to get started on QuickBooks. I especially liked your willingness to accommodate any questions and stay later for more advanced questions. You were super helpful and made the class fun and relaxing. QuickTrainer's QuickBooks Class was extremely helpful! I would recommend this class to anyone starting to use QuickBooks. The instructor was very nice, patient and supportive. My husband and I own Life Stage Videography. With just two of us running the business, we have to be experts in many areas in which we have little or no training. It is my job to take care of all the accounting and I was totally lost. We bought QuickBooks and I felt like I was reading Chinese. I didn't even know where to start. I wasted countless hours trying to make sense of it all. Then I signed up for the QuickBooks class and everything changed. Jim Merritt and his staff were excellent in teaching me how to use all the tools that QuickBooks has to offer. I now actually enjoy reconciling my accounts, printing out reports and entering my charges. It is easy and what used to take two days of my time every week, now takes about 15 minutes. Thank you, QuickTrainer, for giving me back my time and for helping make my business more profitable. I learned short-cut keys, more efficient ways to enter data, and how to organize my expenses via the chart of accounts. I am excited about the many possibilities of the software. Each time I load QuickBooks, I learn. After digesting what I learned today, I will probably call you guys for more! I came with specific questions which were answered. The class is a great start to fully utilizing the QuickBooks program. I learned about invoicing and banking (including reconciliations). I will be more comfortable using this program now.